PROVIDENCE, R.I. — More friends, more fun, and more funds! 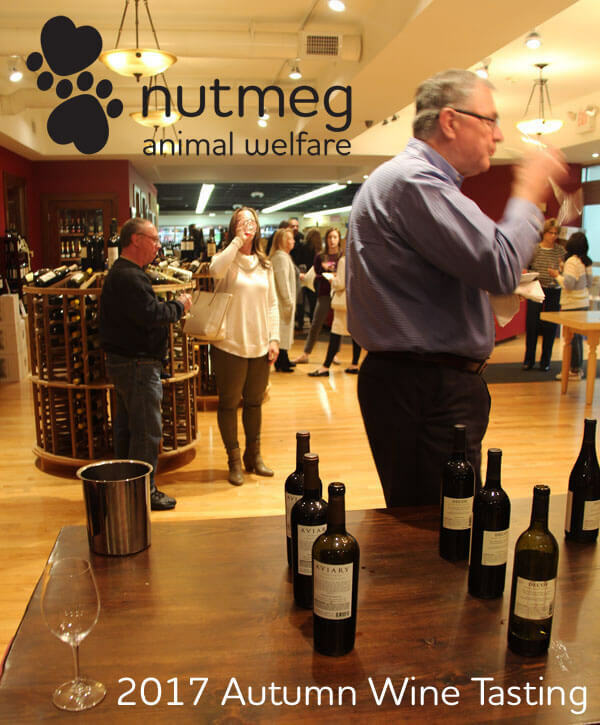 Nutmeg Animal Welfare’s 2nd annual autumn wine-tasting event exceeded everyone’s expectations. 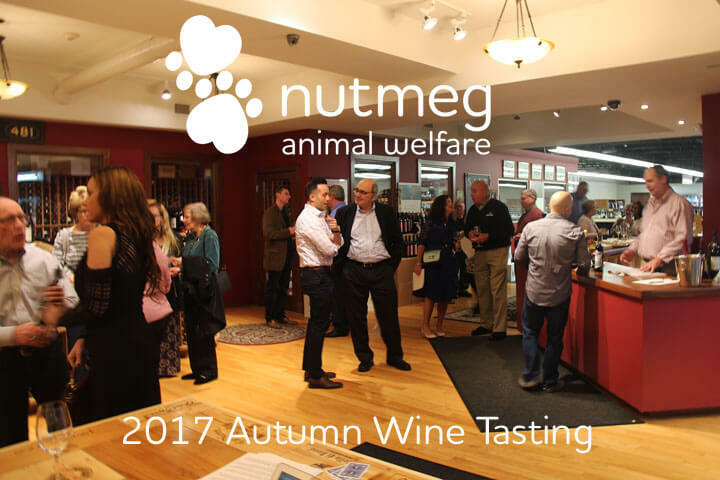 On a gorgeous fall Friday, October 27, 2017, three dozen fellow animal welfare advocates, representing a 75-percent increase in attendance from our inaugural wine tasting last October, gathered once again at Gasbarro’s Wines on Providence’s Federal Hill (Atwells Avenue). They were treated to a night of fine wine selections from the Napa and Sonoma regions of northern California and scrumptious Italian appetizers catered by Pane e Vino restaurant next door. 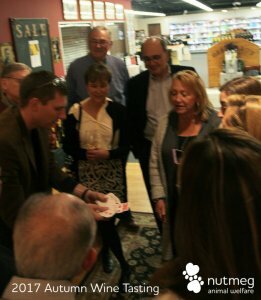 Magician John Duke Logan captivates the crowd with his almost supernatural sleight-of-hand. While guests were busy making the reds, whites, and rosés disappear, talented magician John Duke Logan kept them guessing and guffawing by making playing cards disappear and reappear before their astonished eyes. Logan’s legerdemain wasn’t all that had guests gawking. So, too, did yours truly’s Super Bowl XLIX and LI championship rings (pictured below). Last evening came and went far too quickly. From 6 to 8 p.m., good feelings, good humor, and good conversation flowed as easily as the fabulous vintages on offer. 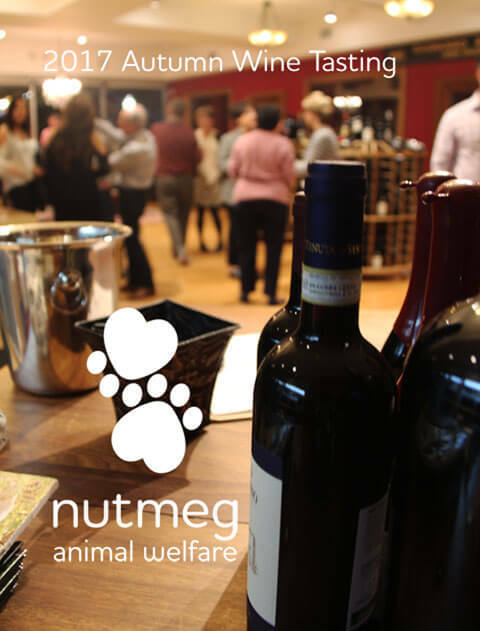 In the process, attendees helped achieve Nutmeg’s 2017 goal of raising $3,000 from this fundraising effort (including online contributions from supporters unable to attend). As guests headed home, most didn’t leave empty-handed. Several people carried boxes and bags of spirits they purchased from Gasbarro’s after sampling the California collection. 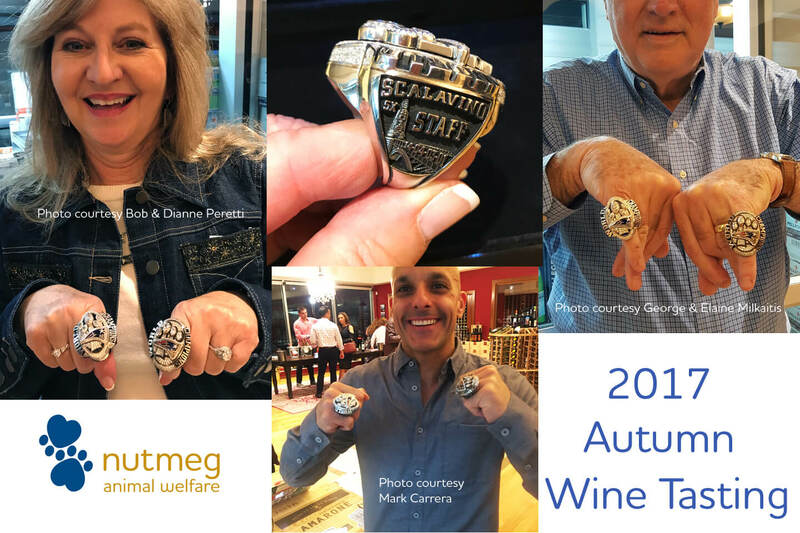 It did all our hearts good not only to bolster Nutmeg’s coffers, but also to help a world-renowned wine region here in the U.S. that’s been devastated recently by wildfires. All eyes are on magician John Duke Logan (left), but none can see the secrets of his prestidigitation. Two of our friends also left with some complimentary gifts, thanks to our “Draw a Card, Win a Card!” raffle, a new addition to the evening’s festivities this year. Playing off Logan’s magic theme, attendees were asked upon arrival to pick a card of their choice from a fanned-out deck of playing cards and place it in a box at the welcome table. Each unique card drawn was assigned to the person who drew it. Before saying our goodbyes for the night, Logan helped draw two of those cards from the box. Animal lover Rebecca Oliver (the Ace of Hearts) won a gift card to Gasbarro’s valued at $50, while Elaine Hervieux’s King of Clubs granted the friend of animals a $100 gift card to Café Nuovo, a popular Providence restaurant (generously donated by Nutmeg supporters Anthony and Stacy Landi). The night is now over, but thankfully, the giving hasn’t yet stopped! Donations continue to trickle in from afar, pushing the total take from our second wine-tasting fundraiser well above our modestly-set threshold. If you’d like to help, we welcome your generosity anytime, in whatever amount is comfortable for you. And if you wish you could have been with us this year, fear not… we’re already thinking about how to make the 2018 wine-tasting evening even better!